Huddersfield maintained their hopes of claiming the League Leaders' Shield as they beat Hull FC to extend their winning run to five games. Hull's Jordan Rankin opened the scoring but, despite having Craig Huby sin-binned, Giants' Aaron Murphy hit back. Jake Connor and Scott Grix went in to give Giants an 18-10 lead at the break, with Rankin pulling a try back. Josh Bowden and Kirk Yeaman scores put Hull ahead, before Huddersfield ran in three unanswered tries. Connor's second effort put Giants back in front before Jermaine McGillvary and Jamie Ellis went over late on. Victory, coupled with St Helens' win over Wigan Warriors, moves Huddersfield to within one point of top spot with one game remaining and leaves all top four clubs in with a chance of claiming the League Leaders' Shield in the final round. A win over leaders Leeds next week would secure Huddersfield a home semi-final. Rankin powered over for Hull's opener in the fourth minute after good work from Mark Minichiello. Huddersfield went a man down with Huby sin-binned for a high hit on Rankin, but the closest the hosts came to capitalising on the advantage was a Rankin grubber kick that Curtis Naughton failed to meet. Huddersfield, playing with greater freedom with 12 men, scored when Connor found Murphy to cross in the corner. With a full complement back on the field, Huddersfield took the lead as Connor spectacularly leapt over in the corner following a clever long pass by Danny Brough and neat off-load from Murphy. 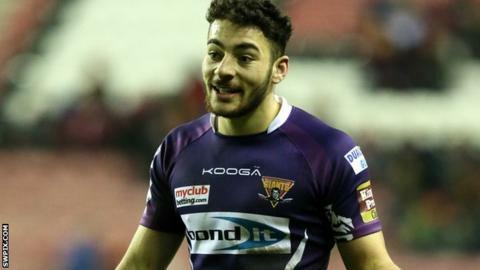 Jack Hughes broke away to put Grix in for Giants' third score, while evasive work from Rankin saw the full-back claim his second try. Brough, who converted two of Giants' first-half efforts, kicked a late penalty to make it 18-10. A defensive mix-up in goal by Huddersfield, trying to deal with a Marc Sneyd grubber kick, allowed Bowden to pounce after the break and Yeaman's effort soon after saw the hosts lead 20-18. Connor again linked up with Murphy to complete his brace and edge Giants back into the lead, but it was not until McGillvary slid over for his 100th try for the club that the win looked secure. With seconds remaining, Ellis got on the end of a Brough grubber kick for Huddersfield's sixth try. "We haven't learned anything that we didn't already know going into the game - there was a load of effort and load of young blokes out there again having a crack for each other. "But they are not quite there and that is something we have to turn around. I want to turn that around next week for Catalans and that is something we have to run around for 2016. "It is the same characteristic mistakes, just balls going down with no real pressure on us, that cost us." "Everyone's been saying the top four has been a dead rubber for a long time - and it is in a lot of respects - but when was the last time you could look at the competition and say all four teams could potentially win it. "Everybody's talked about the top four for a long time and it's never included Huddersfield; unfortunately you have to write about us being in that four now. "It's massive for the competition." Hull FC: Rankin; Naughton, Downs, Yeaman, Logan; Pryce, Sneyd; Paea, Houghton, Watts, Minichiello, Hadley, Abdull. Replacements: Paleaaesina, Turgut, Fash, Bowden. Huddersfield: Grix; McGillvary, Cudjoe, Connor, Murphy; Brough, Ellis; Huby, Leeming, Smith, Wardle, Hughes, Ta'ai. Replacements: Bailey, Lawrence, Kopczak, Mason.